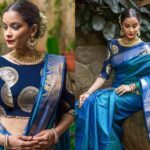 Have you ever wondered how some women make a statement even in an understated saree style? There is a thing about wearing a plain no-fuss sarees with simple blouses and making it look adorable. When we spot such saree style, our admiration for the wearer is huge. Today we are going to discuss one such easy going saree and blouse combination – Plain sarees and Printed blouses. 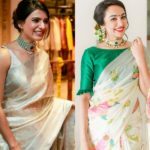 If you have been reading through our earlier post, you would have noticed the trend of plain sarees and the numerous blouse options we have, to make it do wonders to your look. While there are so many blouses available, for a laid back effortless look, our first pick is a printed blouse. 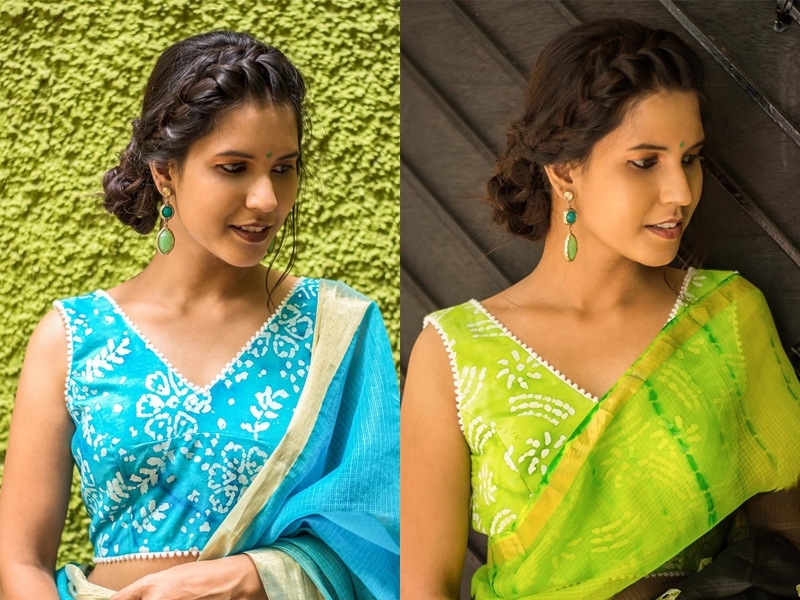 These blouses make even ordinary saree look ultra cool and noticeable if you just pick the right prints on your blouse. Besides, this saree and blouse combination will suit anyone without age barriers. For instance, if you are in your teens, then a plain saree and a stripe blouse would look so apt on you. However, if you have crossed your 30, then a plain saree and a Kalamkari blouse would get you interested. Thus, without being conscious of your age, anyone can literally wear a printed blouse to plain sarees. 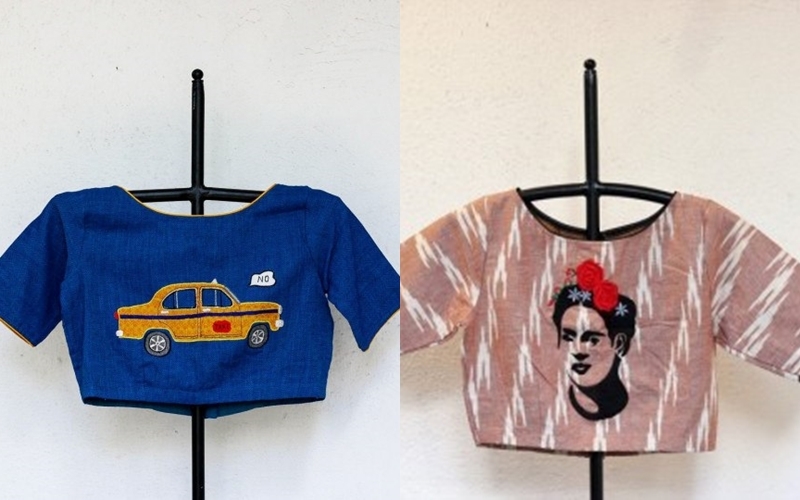 In order to help you pick the best, here below we have 10 attractive prints that would make your blouse look fashion forward. Now scroll down and take a good look on what are they? For a trendy youthful look, you really don’t need to bust your wallet on high end fashion designers. Pick a simple georgette or chiffon saree and pair with a blouse filled with geometric patterns. Boxes and check boxes are the most sought out model on this type. This is again a kind of pattern that would look super good on a printed blouse. If you like to go for a monochrome saree look, especially with hues black and white, then do give this stripe blouse a try. It can be sophisticated and elegant all the way. 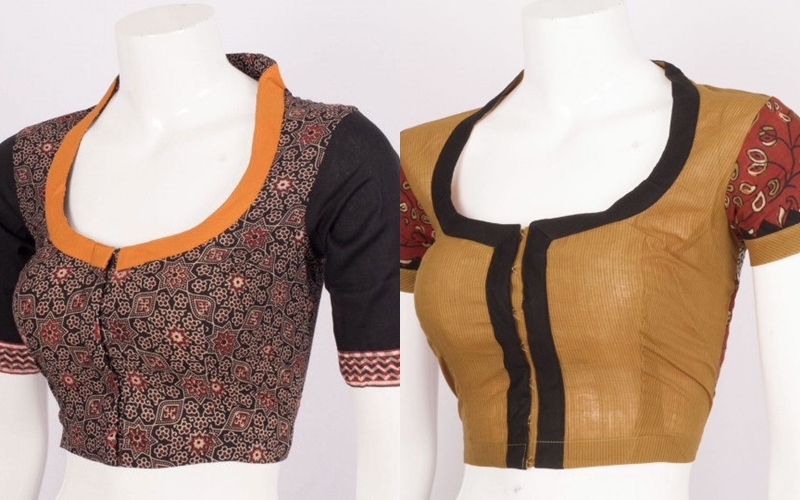 Block prints are mainly done on cotton and other handloom blouses. 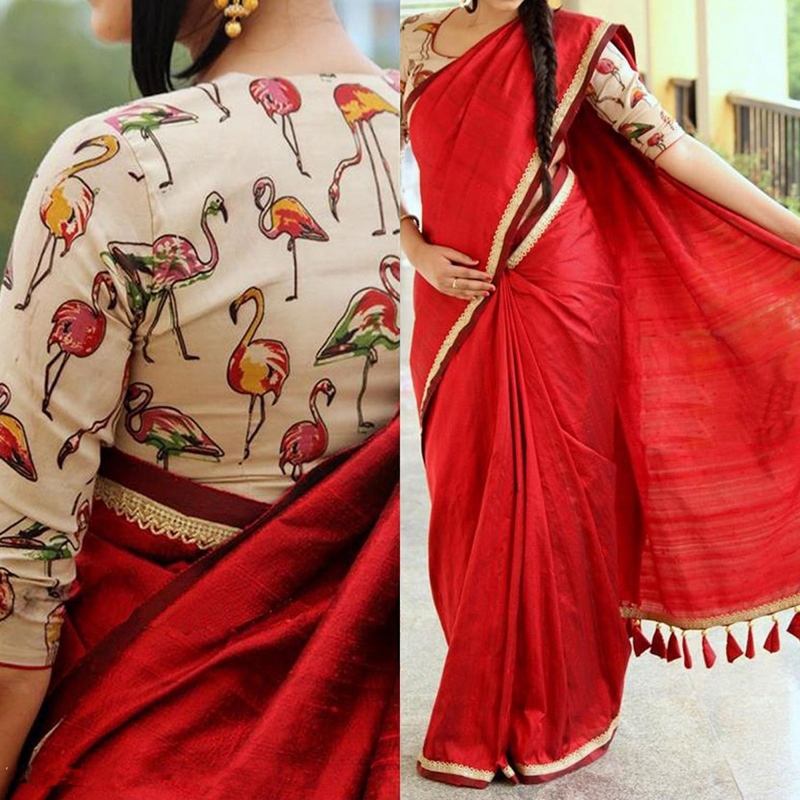 Do opt for noticeable prints that can take your saree to next level. Pairing a block printed blouse with soft handloom sarees are trending this season. You might not want to miss this. If you like an easy going mellowed prints that can convert your blouse for a designer touch, then do opt for sassy digital printed blouses. Wear the below blouses with pastel hues and opt for silver fashion jewellery. You will see compliments pouring on your way. To bring out creative badass girl inside you, opt for blouses that have quirky and fun prints on it. They make your blouse look noticeable even if you stand amidst huge crowd. 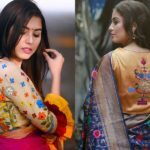 There are many online boutiques that can create customized blouse prints depending upon your requirement, so if you have any unique print on your mind, then do explain your blouse concept and get it stitched. This white batik print blouse can go well from plain cotton sarees to silk drapes. Besides they can bring an aesthetic feel to your saree. So why wait? Give a fresh modern spin to your sarees with batik print blouses. Floral prints needs no introduction in the fashion world. 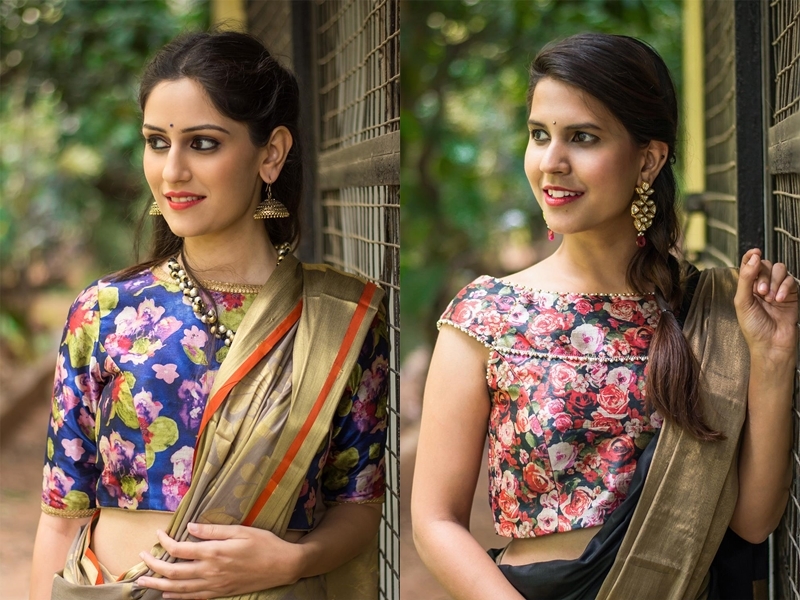 We already wrote a detailed post on how floral blouses can flatter your plain sarees. We have to reiterate the point again, for an edgy youthful saree style, invest on a good floral pattern blouse to wear this season. Another artistic print that will forever be women’s favored choice is the evergreen Kalamkari prints. When they are worn with plain sarees, it indeed brings out such a fine and graceful look to your overall style. Animal motifs are another coveted option to try this season. With every fashion designer finding innovating ways to insert animal patterns on their prestigious creations, you would be missing fashion moments, if you don’t get an animal print blouse to stay on trend. A simple multicolor printed blouse will always remain a best bet as it can be conveniently worn with any saree of any material. 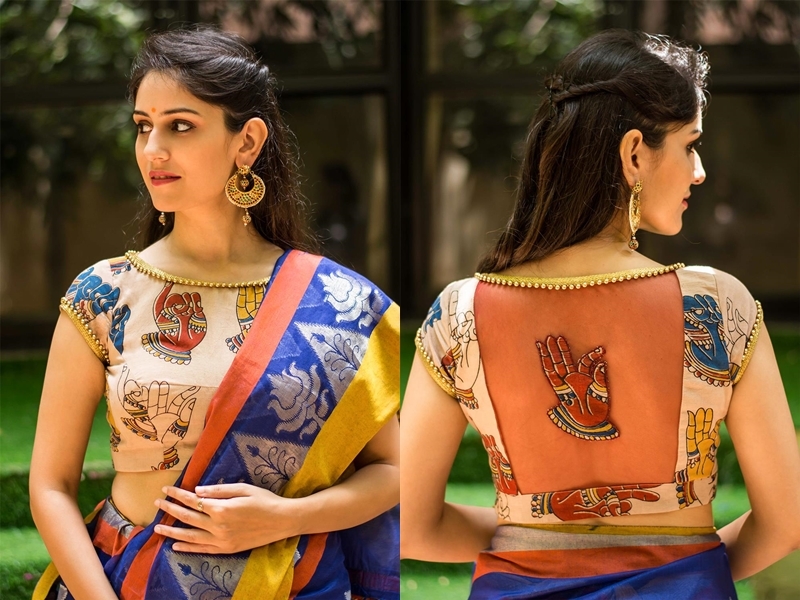 It can make any saree fabric look laudable on it. Needless to say, even your simple cotton sarees can go for a stylish makeover with a blouse like this. 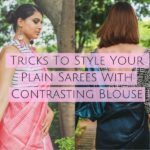 These are some cool printed blouse options you can try with your plain sarees. Good news is that these blouses are less expensive than the other designer blouse option you have on the market. 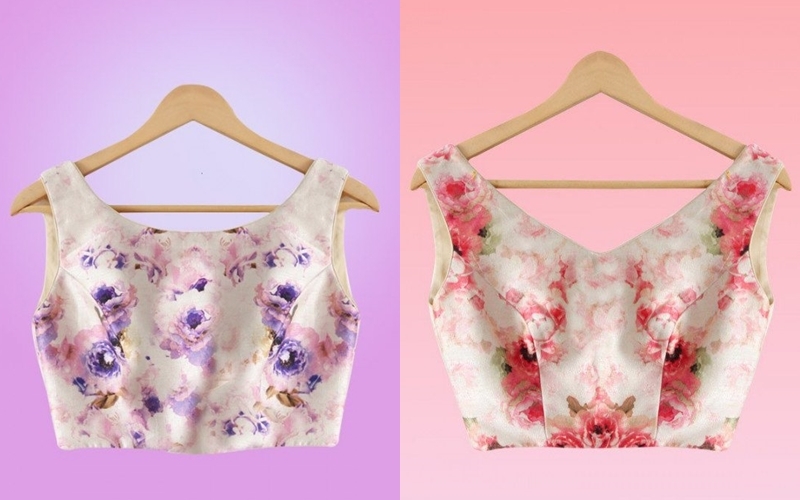 Do invest on a good printed blouse this season and be ready to look trendy on all occasions. Also Read : This Actress Shows 12 Fresh Ways To Wear Plain Sarees!